Hi guys! I'm taking a small break from the glitter swatches again to show you something new I got in the mail last week. Deborah and I both received a lovely package of nail stencils and stickers to show you from She Sells Seashells! They sell a whole bunch of different shapes, like flowers, fishscales, stripes, unicorns(! ), seahorses and more, but today I am showing you one of the different chevron patterns they have. 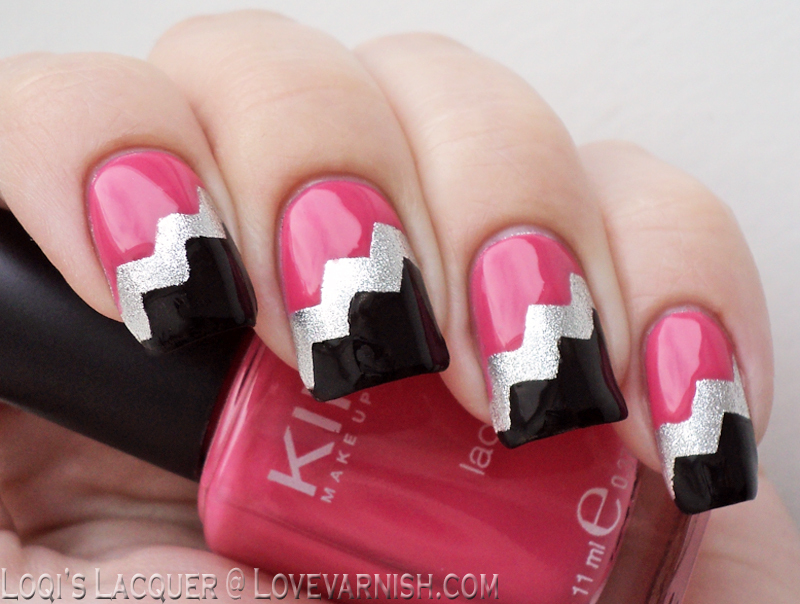 I am so excited to show you this manicure, I absolutely love it! For this manicure I used a base of Sinful Colors Heavy metal and let that dry (you can use a quick dry topcoat to speed this up). 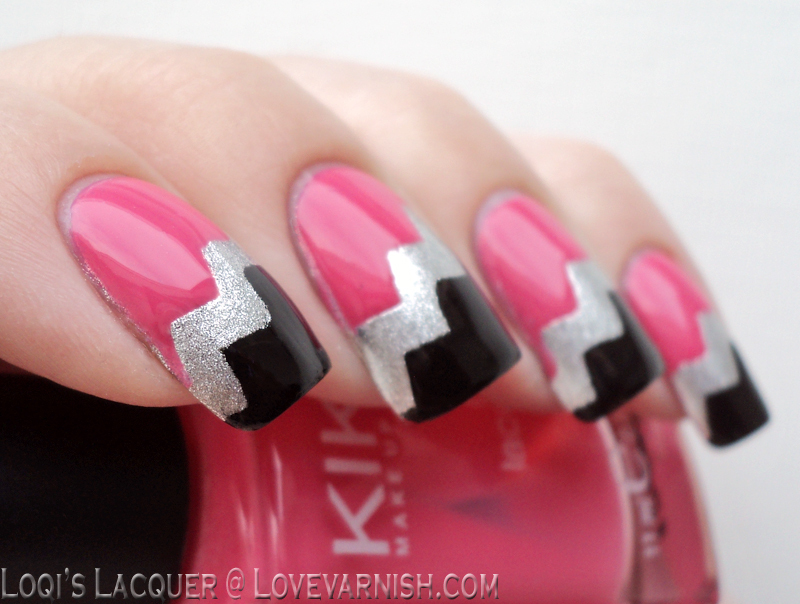 Then I applied the chevron stencils at an angle and painted the top half of my nails with Kiko 282 Coral Pink and the bottom half with Wet 'n Wild Black Crème and immediately removed the stencils after I did each nail. You want to remove them this fast so the polish doesn't get a chance to dry and tear when you remove them. When I did all of my nails this way I cleaned up a bit, applied topcoat and done! I am so impressed by these stencils! They worked fantastic. I always have trouble using scotch tape on my nails to do funky shapes. It never sticks where I want it to but it always manages to pull off parts of my base colour. Nothing of the sort happened with these stencils. They stuck to the nail very nicely and they are made of a flexible material (vinyl) so you can bend and stretch them a bit. You can also easily press them against your cuticles with some tweezers and make a tight seal around the edge of your nails for a crisp line. Removing them was also a breeze, they came of very easily and didn't pull off any of my base colour. I am so happy with how this manicure turned out! I've never made a successful tape manicure with something other than striping tape, so everything except straight lines was out of the question for me, but this was so easy to do! I love it and I will definitely be using these stencils again! You can get these lovely chevron stencils and other shapes and goodies (stickers, studs, shells, decals and more) over at She Sells Seashells. You can also find them on Facebook and check out their Instagram for examples and inspiration! I have some of the decals and I love them just as much as you! This is a great colour combination so I will have to steal it! Vinyls are so hot right now! I have a bunch at home but need to just sit down and play with them. I love how crisp the lines are in your manicure - fantastic! I'm longing to try out some myself too, I usually have the same issues with tape :/ it's so annoying! 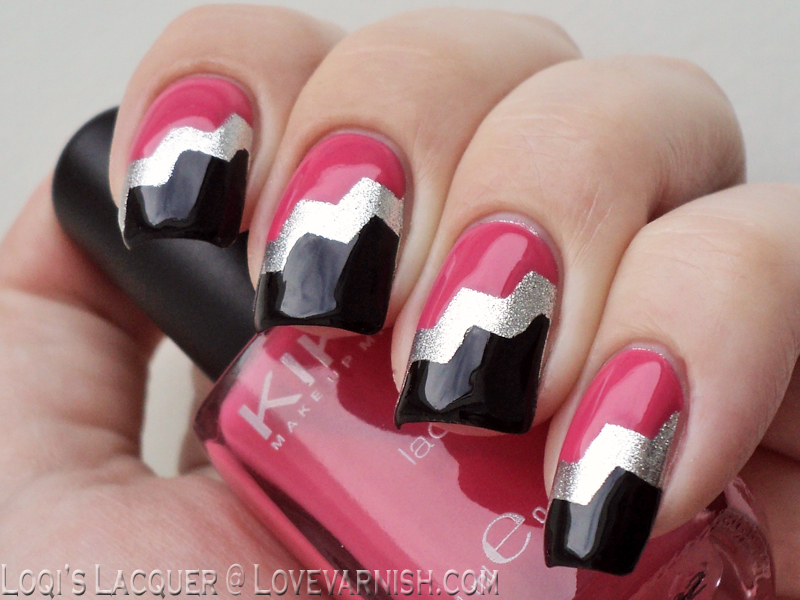 This mani is amazing <3 both for the pattern choice and the colour combo! Fabulous. Love the colors you chose! This is such an awesome manicure! I love all the colors together. Imitation is the greatest form of flattery, so thank you! it's so beautiful and chic! I love these colors together. So girly but rock n roll too!